A large body of previous work has suggested that both short and long birth intervals are associated with poor birth outcomes such as low birth weight and preterm birth, as well as poor long-term socioeconomic outcomes. However, little research has examined whether birth intervals are associated with long-term health. Using full population data from Sweden, Kieron Barclay and a colleague we find that birth spacing is not associated with height, physical fitness, or BMI in early adulthood, nor with mortality in later adulthood. In a study recently published in the journal Demography , my co-author Martin Kolk and I examined whether the length of the interval between births in Sweden is related to long-term health outcomes. The goal of our study was to examine whether the degree of spacing between births had any long-term consequences for the health of either the older or younger child. This study was a follow-up to a paper published in Demography last year where we examined whether birth spacing was associated with a series of cognitive, educational, and labour market outcomes, which we also summarized for N-IUSSP. In our more recent study we examined whether birth spacing is associated with height, physical fitness, or the risk of being either overweight or underweight in early adulthood, as well as mortality in later adulthood. Research on the potential long-term health consequences of particularly short or long birth intervals is scarce – we were only able to identify a tiny handful of previous studies, some examining the relationship between birth intervals and mental health outcomes, and one examining the association with adult mortality in historical China. Given that a large body of research has shown that birth intervals are associated with poor perinatal outcomes such as preterm birth and low birth weight, and those poor birth outcomes are also associated with poor long-term health, we had good reason to suspect that birth intervals shorter than 2 years or longer than 5 years might be associated with poor long-term health. Based on previous work we suspected that short intervals could have particularly negative consequences for the younger of any pair of siblings as the mother may not have been able to physically recover adequately from the previous pregnancy. Very short birth intervals also imply that the older child of the sibling pair was not breastfed, or only for a short time, since breastfeeding greatly reduces the mother’s likelihood of becoming pregnant again (lactational amenorrhea). The health benefits of breastfeeding are well known. Furthermore, having closely spaced siblings might also affect the degree of parental attention, supervision, and investment in each child. For example, less parental attention and supervision might increase the risk of a child having a poor diet, developing unhealthy habits, and being at risk of accidents. In our study we used data on the full Swedish population, and we were able to link children to their parents and siblings. We were also able to link these data to outcomes measured much later in life, specifically health data measured at ages 17 to 20 taken from the military conscription data, and mortality data. Unfortunately the military conscription data were only available for men (born between 1962 and 1979), but the mortality data were available for both sexes (born between 1938 and 1960). In the past, all men in Sweden were legally required to conscript for military service. In order to assign these young men to appropriate divisions and jobs, they underwent a series of examinations, including an assessment of their physical health. We studied several different health measures, which were height, physical fitness, and whether they were overweight or obese, or underweight. Our physical fitness measure was based upon an examination where the conscript rode a stationary exercise bike at maximum intensity. We examined how the length of time between the conscript’s birth and that of an older or younger sibling affected these long-term outcomes. In our study, our primary focus was on comparing biological siblings born to the same mother and father. Using this approach we were able to adjust for many characteristics of the siblings’ parents and childhood home that could not be measured directly using the available data. Since we focused on comparing siblings with one another, this helped us to isolate the importance of the length of the birth interval itself for long-term health outcomes and to reduce the risk that the pattern might be driven by some kind of unobserved third factor potentially correlated with both birth interval length and long-term health, such as the health of the parents themselves. 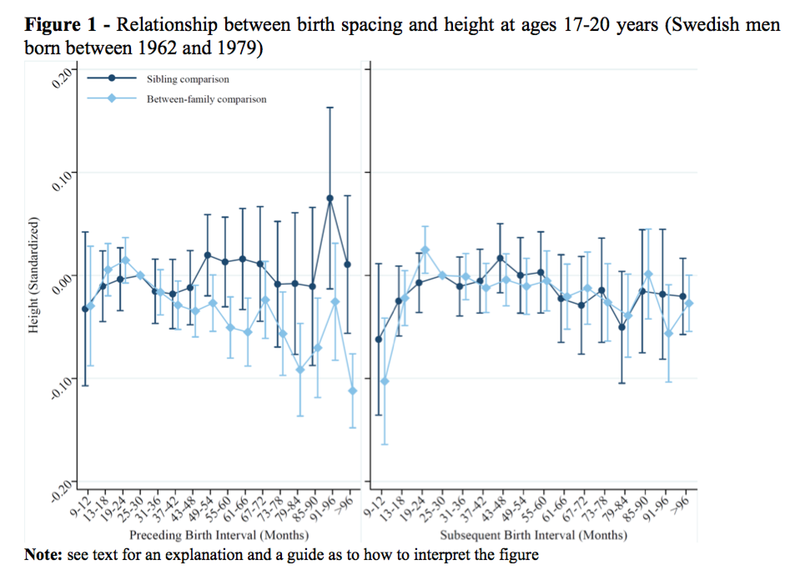 Figure 1 shows the results for the relationship between birth spacing and height at ages 17-20. The left-hand panel of the graph shows the results for the length of the preceding interval (how long after your older sibling were you born), and the right-hand panel the results for the subsequent interval (how long after you was your younger sibling born). The dark blue line shows the results of analyses where we compared siblings born to the same mother and father, and the light blue line those where we did not compare siblings – that is, where we did not adjust for all the factors that siblings share. The x-axis, on the bottom, shows the length of the birth interval. Each of the data points indicates how birth spacing affected educational attainment relative to a reference category, which we decided would be a birth interval of 25-30 months. To give an example of how this graph should be interpreted, consider the right-hand panel. According to the ‘between-family comparison’ (the light blue line), if somebody’s younger sibling was born 6-12 months after them, they were 10% of one standard deviation (corresponding to approximately 0.6cm) shorter than an individual whose younger sibling was born 25-30 months after them. The key results here are shown by the dark blue lines, which show that height varies very little by the length of the birth interval. The key finding of our study is that the length of birth intervals does not matter for long-term health or mortality in contemporary Sweden. It is important to bear in mind that children born before or after particularly short or long birth intervals do seem to do worse, but this is not attributable to the length of the birth interval itself; rather, short and long birth intervals are more common in families that are disadvantaged in other ways, for example in terms of socioeconomic resources. This finding is consistent with our previous study, and also with a number of other recent papers which show that after adjusting for shared parents and shared family conditions, birth intervals do not seem to matter for child outcomes in high-income contexts such as Sweden.